#1.1 Why Choose Sentrysafe for Your Next Gun Safe? 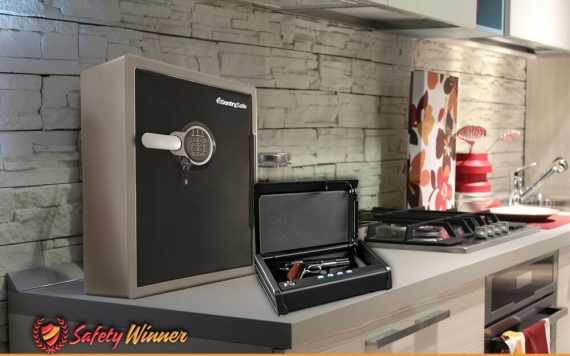 #1.2 10 Best Sentrysafe Gun Safes on the Market! Founded in 1930, by John Brush and his brother-in-law, William Punnet, Sentry Safes is a safe manufacturing company based in New York State. Sentry are famous for being the first company to produce fire-proofed safes in 1955 and continue to innovate with their latest range of fire, flood and theft proof data-storage units. In our review, we like to show you the most amazing points of a Sentry gun safe and the list of best Sentrysafe gun safes. Considered to be one of the top fire resistant safe manufacturers in the world, the SentrySafe Company has been around for many years and they have made a habit out of learning from previous failures and providing you with the top safes on the market. SentrySafe does not only make the most reliable fire-safes, but they also focus on quality extra features without lifting their prices too high. Most of their safes are electronically operated and this might seem like a problem to some, but with the fire resistant plastic coatings, all of their safes are really reliable. What Makes SentrySafe Different From Others? I have looked at a few safes from the company and also talked to multiple people currently owning these safes to get their opinions on the brand and I decided to show you why SentrySafe is one of the most reliable and affordable safe manufacturers on the market. So let’s find out what makes SentrySafe different than anything that you have ever owned. #1 Durable 12-18 Gauge Steel Construction. Depending on the size of your safe, you will have some of the most durable steel to help protect your valuables. The steel used in these safes go through a rigorous process and they get exposed to the elements of nature to help find weaknesses. Once the weaknesses have been found, the company will focus on limiting these weak spots and giving you a better quality safe. SentrySafe also ensures that it will not be possible to drill through their steel with a common house drill and this should give you peace of mind when making your choice. #2 Fire & Water Resistance. The exterior on all of their safes are highly rated when it comes to fire rating and therefore, they specialize in making fire resistant safes. The temperature resistance for most of the safes is between 1550 degrees Fahrenheit and 1700 degrees Fahrenheit for up to 1 hour. This will be great for ensuring that the safe cannot be damaged in the process of a fire and with the warranties, the company will gladly replace the safes, should it ever get damaged through fire. #3 Larger Than Normal Steel Deadbolts. Trying to break open a SentrySafe door can be quite a daunting task and without the right equipment, it will be virtually impossible to do. Most of the locks used on these safes are durable and thick and once they are exposed to heat, they will begin to expand, thus adding more security to the safe and making it harder to break open. Many of their safes also feature large live action bolts that will make the locking process much faster and provide you with the same amount of security. With the already durable interior, SentrySafe also features a metal plated exterior on most of their safes. This also adds another layer of security to the safe and makes the safe much more resistant to impact. I do not recommend storing glass in the safe, but any breakable valuables should work perfectly in these safes and most of the portable versions have been tested to be impact resistant at heights of up to 10 feet. With huge warranties offered by the company, they have also decided to keep the prices affordable for most of their electronically enhanced safes. This will give you the added advantage of advanced technology to help keep your safe secure and also give you faster access in times of need. 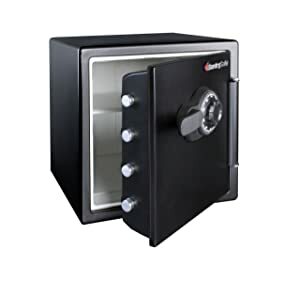 The portable safes all beat out competitors in terms of price and features and I believe that this safe brand will give you value for your hard-earned cash. 10 Best Sentrysafe Gun Safes on the Market! The Sentry Safe Company has been long known for implementing their quality plastic fireproof lining to their safes and with this safe, it is no different. The interior is quite small and this might be a problem for many handgun owners, but the interior will still be great for keeping some smaller firearms. The interior has actually been designed for storing valuables, media devices and paper objects like cash. The safe will be perfect for storing your petty cash if you are a business owner and you will have peace of mind when you know that you and the cashier are the only two with access to the money. The safe features a hardened and high-quality external shell that has been tested to resist impact and also resist some of the toughest breaks in equipment on the planet. Handmade objects will be no match for the durable construction and you can rest assured that no one will be able to pry open the hinges as they are fitted on the inside of the safe. But that is not all. The safe is also fire resistant for up to 30 minutes in temperatures of 1550 degrees Fahrenheit and some experts have even tested this and they believe that it could possibly last longer at higher temperatures. This makes the safe great for storing cash and any media devices and once it is mounted the safe becomes immovable. The safe features a standard, but extremely durable key locking system and everything else on the safe is mechanical. This will eliminate the need for power and regularly checking on the batteries and you will never be caught off guard when the batteries might die. 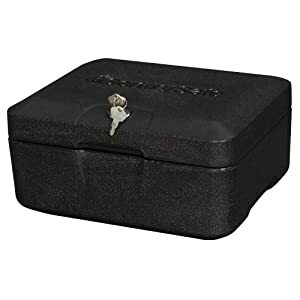 The safe features a standard hook lock that is activated by the key and even though this might not seem strong, we can assure you that the key lock is impossible to pry open and you will need heavy equipment to open the safe as it is also extremely hard to pick. Additionally the safe is easy to mount and all of the mounting equipment has been included, but we do not see the need to mount the safe as it can be used as a portable and extremely safe way to guard your money. The safe is also water resistant and once it has been locked, nothing will be able to get inside or escape. This will be the perfect safe for every business owner that needs complete control over the daily cash flow. We highly recommend the safe for business owners and we believe that the safe will be of great benefit to anyone that is working with cash every day. No longer will you need to stress the fact that someone might steal your daily cash flow and you will also have total control over what is happening with the cash. The interior of the safe is quite small and it will be great for storing a moderate amount of items. You will be able to store a handgun without trouble easily and perhaps even a few clips of ammunition. The interior of the safe has been specially designed with a plastic interior that will keep water out and also add to the heat resistant exterior of the safe. When it is put in water, you will see that none of the water manages to peer through any of the non-existent holes. The safe features a strong and durable solid steel exterior that has been designed and patented by the Sentry Safe Company. The safe is able to withstand temperatures of 1550 degrees Fahrenheit for up to 30 minutes, but during the testing process, the safe was tossed into a furnace that is 2000 degrees Fahrenheit and it also managed to last for 30 minutes. The safe features a traditional key lock with live action locking bolts. The safe is also free from any hinges, thus eliminating any possible weaknesses that may occur and providing you with the best gun safe that can easily be carried around. Even though mounting equipment has not been included, many people choose to mount the safe to ground or even the trunk of their vehicles to ensure that high-quality items and valuables are protected. We highly recommend this safe for travelers or for home use in dangerous and extremely volatile circumstances. The safe will be great for the mining industry and it will definitely be able to ward off any explosion and keep all of your documents and can safe and when you are done, the safe can easily be moved. Unfortunately, the safe is not big enough for storing firearms and only very small firearms will be able to fit inside this small box. Women might also be able to use the safe for storing valuables and jewelry. Another top of the line high-quality safe that has been uniquely designed by the SentrySafe Company. This safe is made of highly durable and fire-resistant solid steel and will be able to withstand temperatures of 1550 degrees Fahrenheit for about 30 minutes. Once exposed to heat, the metal will expand and increase the level of protection offered by the safe. The design is unique and almost gives the impression of a box. This will enhance the storage space and allow you have the power of gravity on your side. Internally the safe has also been uniquely designed and even though the same is not specifically intended for firearms, you will still be able to fit your handgun inside. The design features racks that are specifically made for storing files and important documents. You will also receive an in-lid strap to store items that may be quickly required. 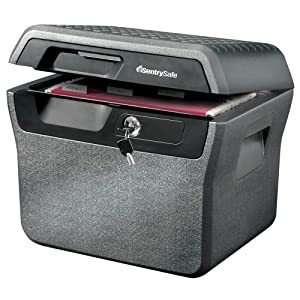 Like with most SentrySafes, the safe is internally made of very high quality and durable plastic that will enhance the insulation and keep your documents and media files secure in warm and wet conditions. The safe features a unique design and can easily be carried around and moved between home and office. With this safe, you will not need to remember any difficult or mind-boggling codes and you will have all the security. This will also ensure that the safe is 100% child proof. We love this safe because of the business advantages and safety features that it possesses. The safe will never let you down and even though it is not 100% safe against prying, the safe will still serve the specific purpose it was designed for and may be a great accessory to your office. Like many other Sentry Safes, this safe has also been designed with the same plastic fire resistant interior that will ensure that all of your media devices and paper items all stay safe. The safe features a smaller interior, but you can be sure that the interior will keep all of your items safe from intruders and nature. The safe also features a built in shelve that will allow you to easily compartmentalize and store more items inside. You will be able to store 2 handguns inside and this will be great for people that have more than one firearm in the family. The hardened steel exterior has been tested to be impact resistant and when you add the protective metal coating, you can be sure that the safe cannot easily be damaged. The safe is definitely designed to be displayed and with the internally built hinges, you can be sure that the safe will never be pried open from the front. The exterior has also been sealed and no water will be able to enter the safe at a depth of up to 8 inches for up to 24 hours. This means that the little water mess on the safe will not do any damage and it can easily be wiped off. The safe is also fire resistant at temperatures of 1700 degrees Fahrenheit for up to 1 hour. This should give you a lot of peace when you are not home. The safe features a strong and durable combination lock that will activate 4 large live action bolts and you will be able to see these huge bolts when you open the safe. With the ability to use multiple different combinations, you can be sure that no one can simply guess your locking combination. The safe will also easily be mounted to a wall using strong deadbolts. Once it has been mounted, you will also notice that it becomes impossible to move and this should ensure that your safe never gets stolen and that it is virtually tamper proof. The safe is virtually childproof and we have not found any instances where children were able to break open or rather play open the locking mechanism. The combination lock features multiple combinations and it will be your job to ensure that you remember this combination as there are no backup keys to help override the locking mechanism. The live action bolts will also expand once the safe is exposed to heat and this will add another layer of security to the door of the safe and with the built in hinges, the safe will be extremely secure and you can rest on holiday with peace of mind. This safe is definitely recommended to individuals with multiple handguns and we believe that you will be able to store multiple items on the inside as well. 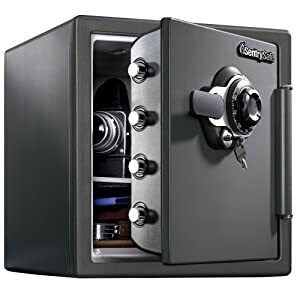 We also think that the safe should make a great gift during the holiday season and we recommend this safe for every person that does not yet own a safe. Add the affordability of the safe and you cannot go wrong by choosing this safe. The safe features quite an average size interior that is great for keeping your firearm and documents. The safe comes with an easy to move steel plate that will allow you to adjust the size of each compartment and will offer you the ability to completely remove it if you need to fit something larger. The interior size is not only great for giving you the opportunity to adjust the compartments, but it also features 1.2 cubic feet of overall space. 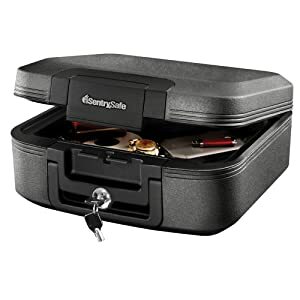 This will make it a great safe for storing multiple handguns and even adding documents. The exterior is made from solid steel and features a combination lock and dual protection key lock. The great thing about having these two features is that they can be used together to provide even more security to your safe. The dual key lock will offer you the opportunity to keep one key while hiding the other and should you be forced to open the lock, you can easily state that you do not have the other key. This feature is not only great for people working with cash, but will also work perfectly if you need to give another person access to the safe. The safe can easily be set up to only use one key and thus if you are not home, you will have peace of mind, knowing that your family is still protected. For years Sentry Safe likes to use a molded plastic interior. This may seem bad for a lot of individuals, but the molded plastic has been proven to be great for resisting fires. Not only will the interior keep all your safe for up to 1 hour in degrees of 1700 Fahrenheit, but it also has the capability of keeping your document and firearms dry while being submerged in up to 8” of water. The Sentry Safe Company has ensured that the safe is made for withstanding anyone trying to pry it open. The safe is extremely heavy and with a weight and when dead bolted, this weight will increase by almost three times. So you can be sure that no one will attempt to move it. For the security, they have added for deadbolts. These deadbolts are almost 60% bigger that the deadbolts on your average safes and the door has also been tested with common theft equipment never to break or even show one sign of weakness. Finally Sentry Safe will give you a lifetime warranty and up to $50 000 worth of insurance, should someone break it open or it may be destroyed in fire. They will also send you a brand new safe for free if your safe should ever break or let you down. When considering purchasing a Sentry safe it is advisable to research the product thoroughly. Check online for customer reviews; don’t just rely on the testimonials provided by Sentry. Ensure that you thoroughly check the warranty; certain models may be guaranteed against theft but not fire or water damage. Finally make sure that you purchase a good quality safe, often this will mean spending more money than you intend, but saving money in the short term will only cost you security in the long. A safe is an investment; so spend now, don’t pay later.